Schlotzsky’s® heads into the holiday season with the return of its popular premium ribeye steak sandwiches. From now until February 26, the home of The Original® round toasted sandwich will feature three new, limited-time-only signature sandwiches made with premium ribeye steak—the bacon & smoked cheddar ribeye, the mushrooms & grilled onions ribeye, and the guacamole & red peppers ribeye. 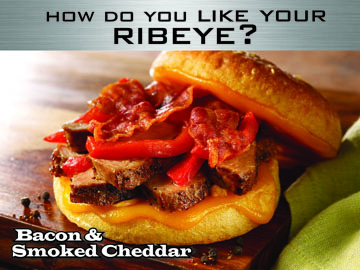 Bacon & Smoked Cheddar Ribeye: featuring strips of juicy ribeye steak, crispy bacon, red bell peppers and smoked cheddar cheese with chipotle mayonnaise, served on Schlotzsky’s signature, Fresh-from-Scratch® toasted sourdough bun. Mushrooms & Grilled Onions Ribeye: made with strips of hearty ribeye steak, caramelized onions, portobello mushrooms, provolone and swiss cheese with garlic pesto and creamy horseradish dressing, served on Schlotzsky’s toasted sourdough bun. 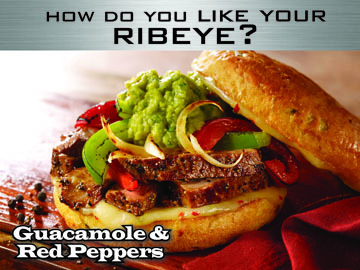 Guacamole & Red Peppers Ribeye: thick strips of ribeye steak paired with fire-roasted vegetables, pepper jack cheese, guacamole and chipotle pesto, served on Schlotzsky’s toasted sourdough bun. Schlotzsky’s® announced today that it has signed a history-making franchise deal to bring 30 new restaurants throughout the Philadelphia metro area that would also house Cinnabon® and Carvel® franchises inside the buildings. With a reimaging effort completed in half of its restaurants, Schlotzsky’s continues to expand its menu, with pizza and salads among the traditional sandwich offerings, and grow its tri-branded locations with sibling brands Carvel and Cinnabon. As a result of these efforts, the 356-unit Schlotzsky’s has seen its customer demographics skewing younger and more female, and same-store sales increases continuing for a sixth year, said Kelly Roddy, president of the Austin, Texas-based Schlotzsky’s division of Focus Brands, which also owns Carvel and Cinnabon. A company spokeswoman said the results have boosted revenue at the remodeled locations for the 40-year-old brand and resulted in new franchise agreements, including 25 for the tri-brand stores in central Texas and New Jersey. Roddy spoke with Nation’s Restaurant News about Schlotzsky’s initiatives. Of your 356 units, how many are the new prototype and how many are reimaged? We will have 35 of the new prototype and new look open by the end of the year. The entire system will be 100 percent reimaged — having painted all the new colors, all the new graphics, all the new signage, all the new menu boards. How many are co-branded and tri-branded units? By the end of December, 165 of the restaurants will have Cinnabon and around 30 will have Cinnabon and Carvel in the tri-brands. Everything that opens starting next year will be a tri-brand. We’re targeting somewhere between 40 and 60 openings next year. What are the major changes of the reimaging? We’ve changed the prototype to the more vibrant, hip new colors. We’ve changed the wall coverings from Old World deli style to a new, hip, more relevant art and design with quirky and unique sayings on the wall like “No Shirtzsky’s, No Shoezsky’s, No Schlotzsky’s.” It makes the restaurant more fun. We’ve gone to softer seating with some booths in the restaurants. Have you made any changes to menu offerings? All our salads, instead of being packaged, are made to order and served on plateware. All of our soups are served on plateware. We’re also doing “Pick 2” offers in all our restaurants, so you can order a half a sandwich and soup or half a sandwich and salad or soup and salad. What changes have you seen in customer demographics? It has brought in a younger demographic and also increased our female customer count. Prior to the new prototype, we were at 52 percent male and 48 percent female. And now we are 52 percent female and 48 percent male. We believe we’ve kept all the male customers and we’ve just increased our customers. Our frequency of 18- to 25-year-olds was our biggest increase. Of the new customers we are seeing in the restaurants, it is mostly 18- to 25-year-olds that increased. The second biggest increase was 25- to 35-year-olds. That’s obviously good for us. Before we were doing anything, we had a 45- to 55-year-old consumer that was pretty much pretty higher income, predominantly male and aging. We needed to attract a younger customer. I think we’ve been able to accomplish that with the healthier menu options and the new, more relevant design. Do the tri-brands require a larger footprint? They are the exact same square footage: anywhere from 2,800 to 3,200 square feet. We were at 72 seats before and our newest store here in Austin is going to have 85 seats. Have sales of any menu items increased? We’ve doubled our salad sales and our soup sales have increased significantly. This is our sixth year in a row of positive comps. We are really going to be going after pizza sales. It’s a smaller percentage of our sales now. We don’t serve it on traditional pizza dough. We use our sourdough bread as the crust. We use pesto and put it through our cheese-melter oven. Rather than being a 20- to 30-minute pizza that you would get from the pizza chains, you can have a made-to-order pizza through the drive-thru in three to five minutes. … We’ve done some tests and doubled the pizza sales. Have you changed the pizza offerings? We introduced an entire new assortment of flavors in September. The initiative to drive sales is a marketing campaign that will launch next year. We’ll offer the personal size eight-inch and also a 10-inch. … Right now, less than 10 percent of our sales are pizzas. In the test stores where we’ve put marketing behind it, it’s nearly 20 percent of sales. Focus Brands is an affiliate of Roark Capital Croup, the private-equity firm in Atlanta, and also owns the Moe’s Southwest Grill restaurant brand. Franchise Partner Danny Quintana opens a new Schlotzsky’s-Cinnabon-Carvel in West El Paso at 7040 N. Mesa. The Schlotzsky’s-Cinnabon in El Paso at 7040 N. Mesa Street is OPEN TODAY! The first 50 people to buy a 6-Pack of Cinnabons will get free Cinnabon for a year! That’s one free Cinnabon Classic Roll every week for 52 weeks! 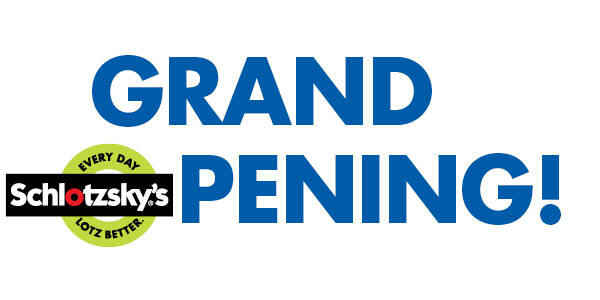 Stop by at 10am for the Chamber ribbon cutting and celebrate with us!